Seasons are beginning to transition around the world during May, and with many of these changes come favorable diving conditions for some of the best dive destinations in the world. Image of the Komodo Islands courtesy of the Indo Aggressor. In Australia, May marks the cool change for the Great Barrier Reef. During this time visibility is spectacular and diving is incredible. The wet season results in fantastic diving and big creature encounters in both the Maldives and the Galapagos Islands. Komodos' high season is on the way, and during May is when dive conditions are some of the most pleasant. Liveaboards operate year round in the Great Barrier Reef and while there is no particular dive season, winter is when the visibility and weather conditions are optimal. May is the last month of autumn, and thus the water is still warm and the rain of the wet season has begun to ease up. The term ‘winter’ can be used very loosely in Australia, especially in tropical north Queensland. You can leave the cable knit jumpers out of your suitcase, as Queensland winters average at around 23 degrees in the water with very little wind and rain. This means pancake flat seas, great visibility and cloudless sunny days. The Great Barrier Reef offers some of the most spectacular diving in not only Australia, but the entire world. A natural structure that can be seen from space, the Reef is home to mover 1500 species of fish, more than 130 species of shark and you can even find six of the seven species of sea turtle that inhabit the ocean in the waters of the Great Barrier Reef. April marks the last month of the dry season in the Maldives, but don’t let that deter you from visiting this phenomenal diver destination. May is the beginning of the southwest season in the Maldives and is one of the best times to spot manta rays. During the southwest season liveaboards tend to focus their itineraries around sites on the western sides of the atolls. During this season, the water temperature drops by around two degrees and averages 26 degrees. Hammerhead sharks and grey reef sharks congregate in larger numbers, along with large schools of pelagic fish. If you’re a fan of diving with big marine life, this is the perfect time to visit the Maldives as manta rays and whale sharks can be spotted regularly along the eastern side of the atolls. The visibility might not be as seemingly never-ending as it is during the drier months, but the encounters with marine life are unforgettable. One of the most bio diverse places on the planet, the Galapagos Islands is on the top of most divers bucket lists. While July to December may offer divers the best chance of bumping into whale sharks underwater, January to May is when conditions and marine life sightings are equally as magical. The peak diving season in the Galapagos is the dry season, which runs from July to December. While the rainfall may be more sporadic, the water and air temperatures drop and seas can be a little rougher which may not be some divers cup of tea. In May, the waters of the Galapagos Islands vary from between 20 – 25 degrees and seas are calmer. The warm water of May and mostly sunny skies mean that May is the perfect time for those who want to visit this wild destination in more comfortable and calm conditions. Whale sharks are encountered more often during dry season (July to December) however during May the chances of spotting manta rays and the schools of hammerheads that the Galapagos Islands are so renowned for is greatly increased. 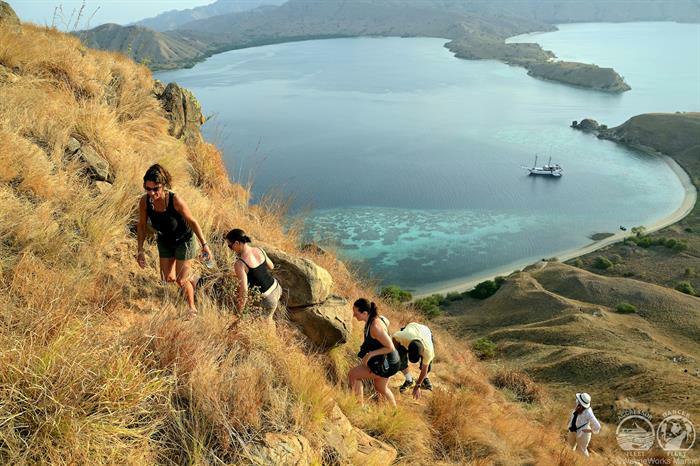 May is bam smack in the middle of the best time to head to the Komodo Islands in Indonesia and visit Komodo National Park. It’s the end of rainy season and the seas are calm with great weather. High season is not in full swing yet, so Komodo Island itself is not crawling with tourists like it may well be a few months later (perks of liveaboard diving - avoiding the often chaotic hustle and bustle of popular travel destinations). Diving during this time is excellent, so aside from seeing the Komodo Dragons the area is so famous for you will see an astonishing array of marine life. Over 1000 species of fish call the waters of Komodo National Park home, and encounters with schools of pelagic fish are a regular occurrence. Liveaboard.com has a unique feature that allows you to search for the destination and month you'd like to book your liveaboard adventure, so simply search for Indonesian liveaboards in May and find your dream trip to Komodo quickly and easily.